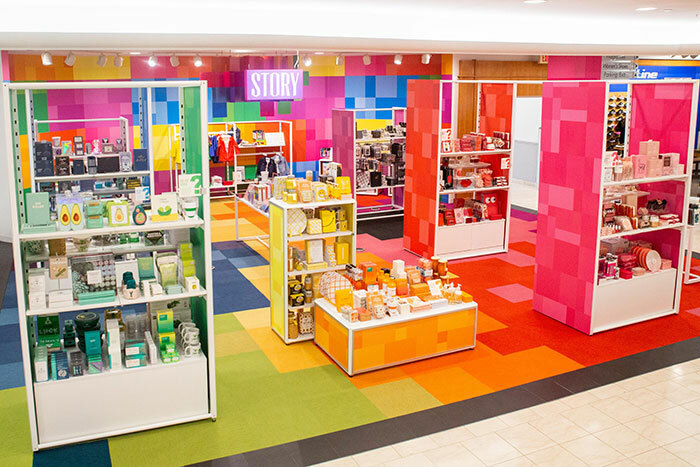 Macy’s is debuting an experiential store concept called STORY, designed to mimic a magazine layout and featuring a host of different merchandise every month under a common theme. The department store acquired Story from founder Rachel Shechtman last year, and is hoping to enable in-store discovery experiences inspired by the way consumers browse on Instagram. STORY’s debut theme is “Color, and will include over 400 products from more than 70 participating small businesses and several big names. Familiar brands shoppers can expect to see include MAC, Levi’s Kids and Crayola. Story will be added into 36 Macy’s locations across the country, five in New York and California, four in New Jersey, three in Texas, Florida, and Ohio, two in Georgia, Washington, Illinois, Pennsylvania, and one in Kentucky, Indiana, Minnesota, Nevada, and D.C.
“The discovery-led, narrative experience of STORY gives new customers a fresh reason to visit our stores and gives the current Macy’s customer even more reason to come back again and again throughout the year,” said Jeff Gennette, Macy’s, Inc. chairman & chief executive officer.